At the very northern edge of North America is Ellesmere Island, where the unforgiving Arctic winds tear through the tundra, dipping temperatures to 40 below zero. 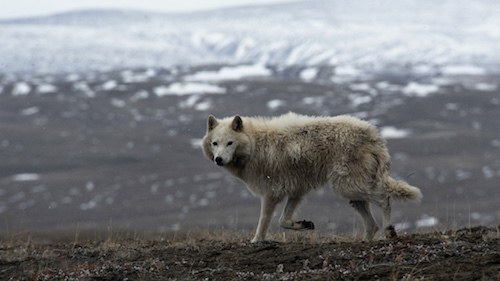 Running through this shifting sea of snow and ice is one of the most hardened predators on the planet, the White Wolf. But as the spring melt approaches, these roaming hunters must adapt to being tethered parents as new additions to the pack have just been born. With their herds of prey continuing to move, we witness a desperate race to keep up and bring back a kill to the hungry mothers and cubs. Traveling farther and farther away from their den each day puts these hunters and their children at risk in this fight for survival. One hour. Narrated by Campbell Scott. • Arctic Wolf Pack takes place on Ellesmere Island, a polar desert at Canada’s northernmost edge that is a mere 500 miles from the North Pole and receives little more than three inches of rain a year. 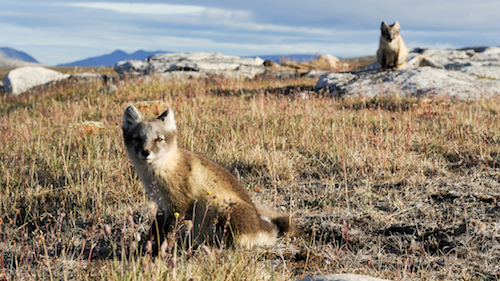 • Rivalries between wolf packs are common, as wolves on Ellesmere Island are driven by the same fundamental desire: to find food and territory and to defend it with their lives. • When packs clash, the largest family almost always wins, even if there is a difference of just one. The most dangerous threat to wolves in this environment is from other wolves. 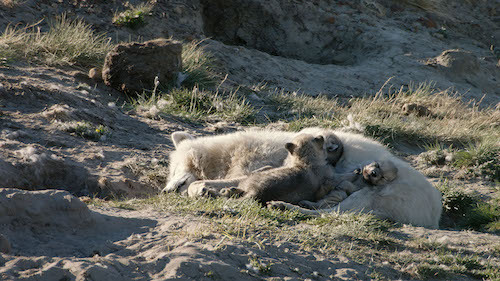 • When food is scarce, less than half of all Arctic wolf pups will survive the summer months. • Most of the year, the wolves will roam their territory like nomads, but during the denning season, wolves hunting for food can travel 25 miles a day, and be gone for up to a week. • After being spotted by a rival pack, a female wolf attempts to lead them away from her family. This proves to be unsuccessful, as the pack then raids her den, killing the pups. Unable to help, the female wolf howls over and over again into the distance. Raids like these are not uncommon, but this is the first time one has been filmed. • Filmed for the first time, a second female wolf, who previously had pups of her own, joins a pack and assists the matriarch by nursing her pups. Two female wolves nursing the same litter is an extremely rare occurrence and has never been documented before.